Herbsmith Rx Morinda Hindend Support is useful for the animal with chronic hindend weakness. Wei syndrome seen as chronic progressive hindlimb weakness. Wei syndrome is the chronic development of kidney yin and Qi depletion leading to the older animal with chronic progressive hindlimb weakness. 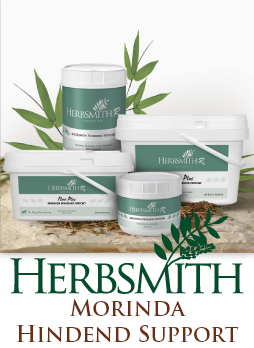 The herbs in Herbsmith Rx Morinda Hindend Support are useful to tonify Qi, nourish yin and strengthen the hindlimbs. Precautions: Not to be used in pregnant mares.